Why buy when you can make them easily at home? These are so easy and also use up all those bits of cereal from the bottom of the boxes, if you have kiddies, you know what I mean! Line a 9” by 13” tin with baking parchment. I used a glass pyrex oblong dish. In a large saucepan melt the butter and marshmallows until completely melted and all gooey. Pour the mixed cereal straight in and stir well to combine, making sure all the cereal is covered in the marshmallow mixture. Pour into your lined tin, leave to cool for awhile then place in the fridge. 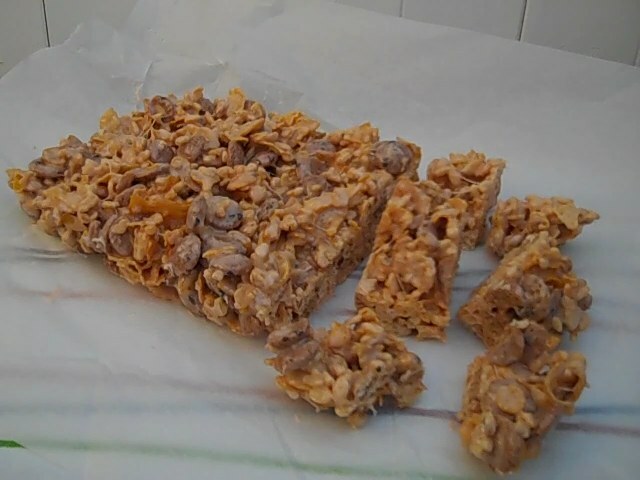 I used rice crispies, sugar puffs, frosties and cookie crisp cereals but use up whatever you have!